Selecting the right play sets for kids becomes a quite a stressful task for parents. There are various playground equipment like see saw, tube slides, playhouse, swing sets on which kids love to play. If you want to have something which not only run highs in fun but is also safe your children, go for wooden play sets. A majority of parents in the United States of America are more likely to buy wooden sets for their kids. These are considered as the safest playground equipment for children. It is constructed with sturdy & strong wood such as cedar, timber and redwood. Each piece of wood in the playground equipment is carefully placed, eliminating the scope of point edges which can harm the kids. Wooden equipment is tested thoroughly by the manufacture before final delivery. With its nature resistant property, wooden playground equipment can resist harsh weather conditions. These do not get corroded and have comparatively longer life than metal and plastic play sets. 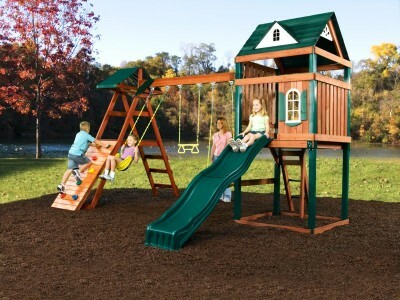 Moreover, swings, tube slides for playgrounds also get easily attached to wooden play sets in few simple sets. But before you buy wooden play set for your backyard, make sure manufacture has constructed it as per Consumer Product Safety Commission (CPSC) and American Society of Testing and Materials (ASTM) guidelines. How to Build Backyard Playground?